As a car guy, today is HISTORIC-- like none I've ever heard of. An entire company's vision and purpose for existence-- as embodied by its CEO, the kind of personification of a company that's a throwback to different time-- will be put up to public scrutiny to thrive... or die. The stakes are HUGE, even bigger than the lines worldwide today as thousands placed deposits on a completely unknown car. Absolutely unprecedented. By the time it hits the road, our Chrysler will be 18 years old so we have secured our place in line to replace it with a Model 3. Now we wait to see if Tesla comes through. I had to work my usual job-- I didn't take off like a lot of you might have-- so I cajoled my wife into making the pilgrimage down to Ross Park Mall to place our reservation. I expected a line... but 930am seemed reasonable enough. I had no idea. We'd been perusing the listings for CPO Signature Red Model S's but didn't want to make a move until we knew what the Model 3 was. So part one of that plan was to WAIT. Breathe deep... suffer more issues with the aging 2/3rds of our cars and see what Tesla came up with, even though some spectacularly good CPO Sig Reds drifted through Tesla's inventory listings. Part two of the plan is to do what was necessary to be as early in the line as we could be. We did that with the Model X (but then bought our S instead) and having options are good. Part three of the plan is to watch the unveiling and see if we want to wait for it-- and if so, how much will it change from the debut to production and does THAT change our desires? After all, by the time a high spec Model 3 rolls off the line in late 2017, the early Autopilot-equipped D-variants of the S will be deep into CPO sales and probably the same price. And we KNOW we like those! So my wife was going to mosey over to the mall at opening and get a reservation. No biggie. Then Twitter lit up and Reddit went nuts. Even after that I wasn't too concerned. Many Pittsburghers I've met STILL can't identify a Tesla... but then I saw the Ross Park line get tweeted. CRAP!! RUN!!! My saintly and beautiful wife expedited her departure preps and rushed to mall. (We'll come back to that Service Center comment in a few days, I suspect. Trying to confirm something.) I actually had the Tesla with me, but she still parked near "our section" and sent me this picture of the line forming OUTSIDE the mall. Once inside she quickly found the Tesla community (and community-to-be) smiling and making a party out of the wait. Whew. That means I'm off the hook for sending her to do the deed! She told me that she was about 40 people back in line and had (fortunately) wound up next to some other women... and they were apparently only about 6 women in a line of almost 100 people. Not sure what the means, so-- MOVING ON! H/T Ryan Poling for this picture. We knew a number of people in the line-- owners and nonowners-- and I was getting great updates from them of my wife's progress. I'd given her all the credentials but was bracing for a last minute complication. After a brief server crash (Oh, THERE it is), a buddy sent me the picture above. We were getting our skin in the game! Whew! The Tesla servers seemed to stay down the rest of the afternoon. The mobile app worked fine, but since I hadn't received a confirmation email I wanted to login to MyTesla account online and verify the reservation. No dice... just spinning wheels. Finally, right before dinner. It worked. Yay! I wish I could decode the sequence of the reservation numbers but since we're not going to be in the first rounds of deliveries I guess it doesn't really matter. The early cars will be going to employees and then owners closer to the factory. One missed opportunity though-- and Elon, it's frankly a little disappointing. The model names are not defaulting to the order one would EXPECT. I mean, it was kinda the point, right? So here we are. The day is winding down. The reveal is coming soon. 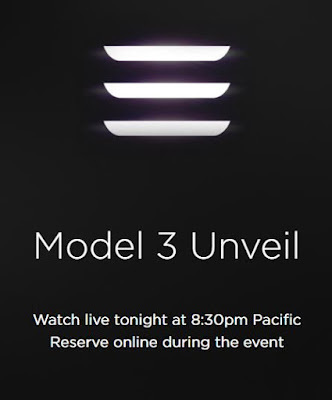 A MAJORLY important day in the auto industry and a huge moment in the life of Tesla. I can't help but consider it all and think that Preston Tucker is enjoying the show. Revenge of the Electric Car, INDEED. Thanks for visiting us here! CLICK to read more at www.TeslaPittsburgh.com, check out the videos on our YouTube channel at www.YouTube.com/NZCUTR and follow us on Twitter: https://twitter.com/TeslaPittsburgh. Local owners/enthusiasts are encouraged to join our CLUB page: https://www.facebook.com/groups/TeslaPittsburgh/ Please note: We are not specifically authorized, sponsored by, or otherwise directly associated with Tesla Motors and make no claims to be so.